It’s that time of year again, when Advent Botany offers up a feast of festive plants. Long-term readers will remember last year’s Night of the Radishes, my contribution to the Advent Botany 2015 cohort. There was also a 2014 selection. You’d think we (ethno)botanists would be running out of Christmas-themed plants right about now, but pish! We’re still going strong. Actually I had a real struggle coming up with something this year, but as it happens I have been developing an interest in cake baking (and no, it doesn’t have anything do to with GBBO, I just watched that one episode with the family… I just like good cake) and the first one I chose to make was a spiced honey cake. I’m still perfecting it (watch this space), but OMG it has a delightfully complex flavour. And it involves grinding cardamom seeds in my pestle and mortar, which I so rarely get to use. Anyway, at first I was impressed by the fragrant nature of the cardamom in the cake. Then I realised that the addictive nature of the cake was coming from one of the other flavours – the caraway seeds, which I’ve never really got to know as a spice. To me they are reminiscent of Gripe Water, the over-the-counter medication my mum used to spoon feed me when I had a tummy ache as a kid. I used to love it. It’s not the same anymore, they took the alcohol out (boo! ), but a quick internet search suggests that (a) it is probably a placebo and (b) the usual main flavouring is dill seed. But that’s what caraway reminds me of. 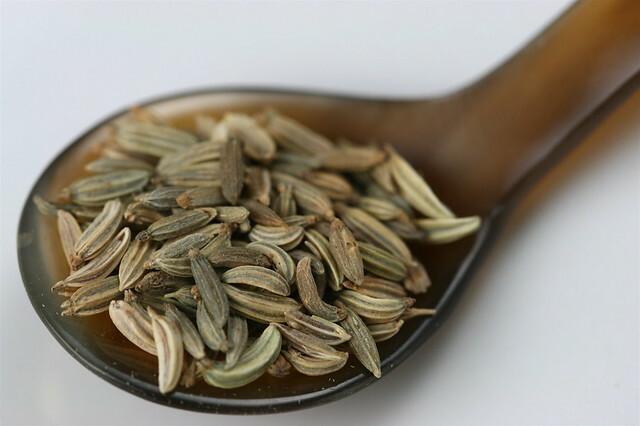 What we think of as caraway seeds are actually dried fruit. Caraway (Carum carvi) is a hardy biennial in the Apiaceae (the carrot family), growing 45-60cm high. It produces cream white umbellifer flowers in June and July, which are popular with beneficial insects. The ‘seeds’ ripen in August. 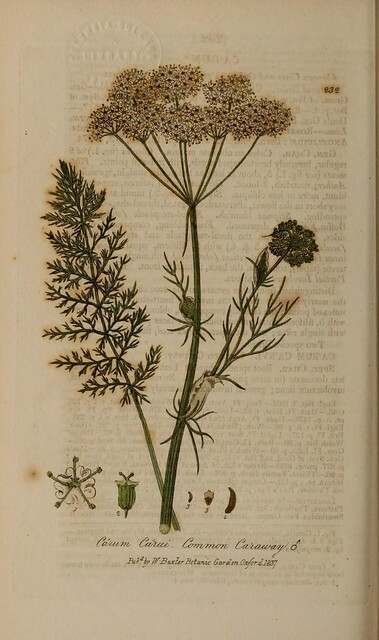 Caraway (also known as Persian cumin) has some interesting mythology around it. It was thought that it prevented theft, and that attempting to steal objects containing caraway seeds would lead to the thief being trapped in the house. As an extension of that concept caraway was fed to geese and pigeons, in the belief that it would stop them straying. And it was also used in love potions…. But the main appeal of the plant is its culinary value. It has an aniseed flavour, with subtle notes of citrus and even mint. It has the ability to cut through richness, and so is good with rich meat dishes and strong cheeses. And yet it also has an affinity with vegetables, particularly potatoes and cabbage. As if that weren’t enough, this versatile spice is a great addition to sweet cakes and biscuits. Caraway cake and biscuits were popular in Elizabethan times, and sugar-coated seeds were served with spiced wine at the end of a meal. After a spell in the doldrums, caraway’s popularity rose again in Victorian times, thanks to an interest in all things Germanic that Prince Albert brought to the UK. It’s in sweet things that we find the link to Christmas, as Caraway Christmas Cookies (AKA Abernathy biscuits) are a popular choice at this time of year. I’ve also found recipes for lemon and caraway biscuits, which sound divine, and rosemary and toasted caraway shortbread, which sounds… intriguing. For a wider selection of recipes, including savoury dishes using caraway, have a look at the BBC Food website (the Hairy Bikers seem to be fans), or Hugh Fearnley-Whittingstall’s caraway recipes in the Guardian. If I’ve managed to convince you that caraway is worth growing in your garden, then you’re in good company – Alys Fowler thinks that caraway is the new parsnip. She’s referring to the edible roots, which used to be commonly eaten. They’re not as big as parsnips, however. Roots are best eaten at the end of the plant’s first year; once it has flowered and set seed they go woody, although they’re still edible. Growing your own also allows you the unusual experience of eating young caraway foliage in salads, or using it as a herb. It is suited to creamy sauces, potato salads, and fish dishes. If you harvest your own seed (best done just before it’s ripe, as it shatters) then you can also try caraway microgreens. Germination of fresh seed takes 8-12 days. It can be a little erratic, and sometimes benefits from stratifcation. Although seeds are normally sown in March/April indoors and May/June outdoors, they can be sown in the autumn outdoors. Resulting plants will flower the following summer. Any transplanting is best done early, as the plant grows long taproots, final spacing is 30cm, and caraway enjoys a sunny spot. Fertile soil will help if you’re thinking in terms of a root harvest. Two plants, which would look good in the flower border, would provide a year’s supply of caraway seeds, and this species happily self seed if allowed. Gardeners in the UK can order Caraway plants from Lubera and Victoriana Nursery Gardens. You may find a plant in your local garden centre, but I don’t remember ever seeing one. 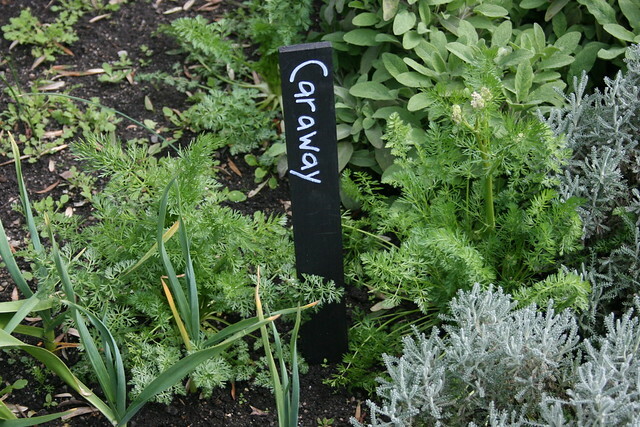 It’s more commonly available as seeds, and in garden centres you can look out for caraway in Jekka’s herb range. For mail order, try Victoriana Nursery Gardens or Chiltern Seeds.